I met my perfect woman the other day, and–from the back, at least– she looks fantastic. 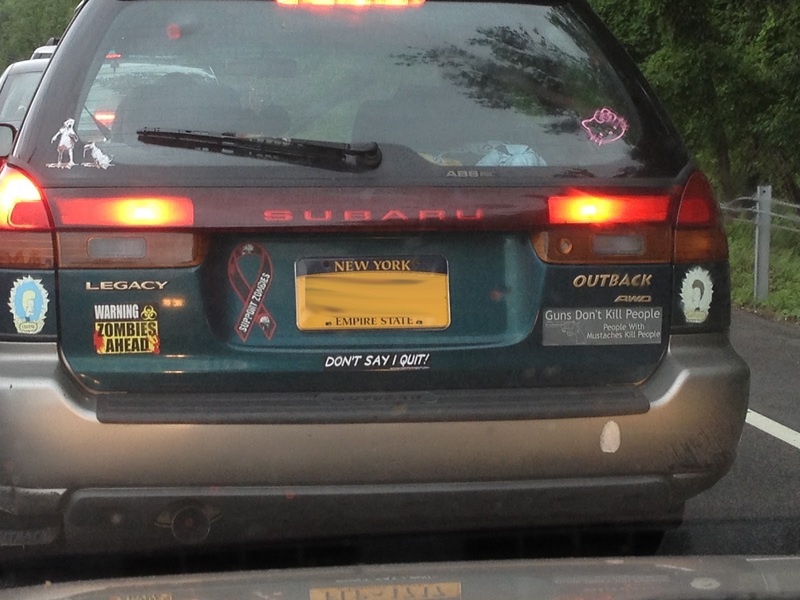 First off, she drives an Outback. Clearly, this is a woman who is more than comfortable taking what she can get. That's definitely in my favor. Beavis and Butthead bumper stickers. 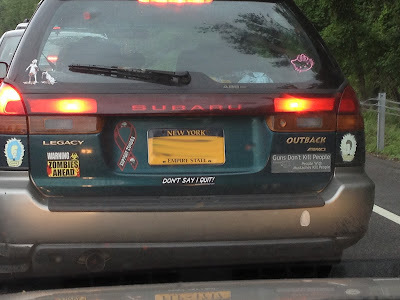 Next, zombie family/pet decals in the window, "Warning: Zombies Ahead," and "Support Zombies" bumper stickers. Great taste in villains: mass panic, lemmings, consumerism, mankind as a whole; none of this evil machine garbage. "Guns don't kill people. People with mustaches kill people" sticker says "I remember The Simpsons making fun of Death Wish, but am too young to actually remember Death Wish. Also, it makes my own 'stache appear dangerous. Pink Hello Kitty window decal says "I'm still a girl, despite all my other vehicular accoutrements." There's a large, half-drunk Snapple classic in the trunk of that hatchback. Looks like you were in traffic. Did you get out of your car and knock on her window?